For one glorious afternoon in the first century God took back the Jerusalem temple. Can you see the scene in its chaotic wonderfulness? The wreckage of the temple market is strewn all around—tables tipped over, chairs with their legs in the air, freed doves underfoot pecking away at spilled grain. Meanwhile a stream of unfortunates begins trickling in. There's a blind man stick-jabbing, hand-feeling his way. And here comes another hop-hobbling on crutches and another stoop-shouldered, shuffling between his helpful sons. "We've heard Jesus is here. Can you take us to Jesus?" 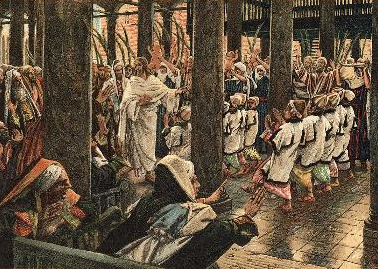 The children that ran with the palm-branch-waving crowd have followed Him into the temple too. With the energy and exuberance of kids everywhere they cut through they line that is forming to dance circles around Jesus as they resume the chant: "Hosanna! Hosanna to the Son of David!" People get fixed, healed, straightened, loosed, and the excitement grows. This is not a King who only rides through the streets fulfilling a parable-prophecy, but Someone who has power to actually change things—heal sicknesses, correct conditions where they matter, where people live! The scribes and pharisees miss it completely. Matthew underlines the irony of the scene: He was doing "wonderful things" but they were "indignant." Jesus was so comfortable with the less-than-perfect, the poor, the desperate, the accused, the lame, the blind, the ones with issues. Almost all His miracles are performed on such. When He went to parties it was with the outcasts. When He told stories about banquets, it was this class of people that got the invite that took, because they came. Far be it from you and me, perhaps somewhat set in our faith ways, to be the chief priests and scribes kind of cold-water-throwers when these types begin coming to our meeting places. When the addicts get freed and happy, when the tattooed former motorcycle gang member leads his leather-clad buddies right into "our" pew, when God, using His unconventional-to-us ways takes over at our church — will we respond with indignation or become part of God's palm-waving, Hosanna-singing program? PRAYER: Dear God, help me to recognize Your working, welcome and join it, it rather than feeling threatened because it doesn't fit with old custom and tradition. Amen.